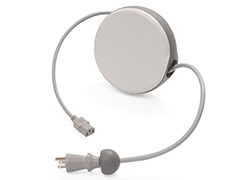 Our DuraReel plastic power cord reel is specifically designed for medical applications to look and feel like an integrated component of a medical device. The surface of the reel is smooth and easy to clean, and the cord reel housing is embedded with a permanent antimicrobial additive to continually protect the cord reel from mold, mildew and odor. The DuraReel is beautifully engineered to provide an attractive and aesthetically pleasing cable management solution while being designed and tested to the same durability and reliability standards as our metal cord reels. Molded with a high quality impact-resistant plastic housing, this cable winder can take a beating and keep on reeling. Select from our list of standard DuraReel power cord reels or contact our sales department to configure your custom reel today. - White/gray housing is molded with a permanent antimicrobial additive to continually protect the cord reel from mold, mildew and odor. Learn more about our medical grade power cord reels in our catalog or see the 7.5" cord reel Selection Guide below for more information about specific models. 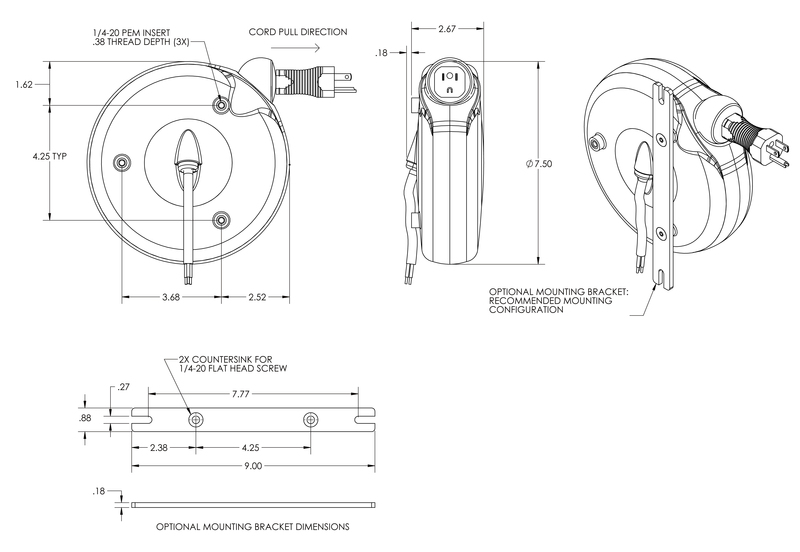 Request more information to see how we can help you with a medical grade power cord reel that suits your need.